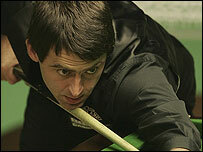 O’Sullivan vs Williams - Joakim A.
Ronnie O’Sullivan is playing against Mark Williams in the second round right now. If you don’t have eurosport you can follow the exciting match on eurosport or on the bbc website. It’s brilliant snooker, so don’t miss it!